Sunday of the Holy Forefathers. The Great Supper; An Invitation to Become, Not to Eat. I know that this homily covers last sunday, but I have just finished putting the transcribed version online, even while at a retreat in the Valley and I did not want to waste the fervent labors of Helen, who transcribed it about 3 weeks ago! The Great Supper; An Invitation to Become, Not to Eat. Today, brothers and sisters, is the Sunday of the Holy Forefathers. It is the first of two Sundays immediately preceding Nativity. We have these special readings. Today we hear a parable about the great supper, and I submit to you that this supper is not the one that we eat. It is one that we become. If you understand the supper in this way, then you will understand why it is that people didn’t want to come to the supper. Very few people are willing to turn down a free meal, right? This was not a free meal. This was the way of life that makes us free. The certain man, of course, is God. And that great supper is our becoming like Him so that we will know Him. Supper is at the end of the day. I learned this when I came to Dallas. In the South they have this idea of dinner as supper. In the North, dinner and supper are the same meal. But in the South, dinner is the lunch, usually enough lunch to feed an army and then supper later if you can somehow stand to eat it. Supper is at the end of our life, and it also our total life. So it really means two things. In the end, of course, there will be the table heavy laden, and we will be with Christ. We will know Him, see Him, face-to-face, no longer in a glass darkly, but face-to-face without fear and without shame – If we live our life now in such a way that we will be ready when things are all ready, as the parable says. So the supper is our life. The supper is becoming. Look at the people that did not want to come to the supper, all because they had their own priorities and their own desires. One says, I’ve got some ground that I just bought, I want to go see it. The fathers speak about that as being possessions that can tie us down. Another one says, I have five yoke of oxen; I go to prove them. The five yoke are the five senses, and therefore, all of our different desires that we have for pleasure. Another says I have a wife that I just married; I cannot come. That is also our own self desires, our own selfishness for pleasure. These excuses, in microcosm, describe all of the excuses that we have for not living the Christian life. The supper is not one that we just sit down at. The supper is one that we are becoming. Saint Paul says today, “When Christ, Who is our life, shall appear, then we shall also appear with Him in glory,” as at the supper. But to appear with Christ in glory means we must obey Him and live as He lives. It is entirely appropriate that we discuss this parable just before Nativity because, without Christ, we would not have any life. So this calling to the supper, we can only obey this calling with Christ helping us, because Christ became man and lived the life that He wants us to live and made us capable of living that life. Be careful in your life. Take a look and see what excuses you are giving that you don’t want to come to this supper. Think sometimes, especially in our semi-Christian society, what passes for Christianity is this idea that you go to glory and this glorious thing because you believe in Jesus Christ, without any of the substance of what it takes to be able to be part of this glory. What it takes is to live as Christ lived. That’s an order, not just to them; it is an order to us. If we are to be part of this supper, then we have to have the mentality of the one who gave it. We should desire to compel others to come into it by the way we live our life. It’s a very powerful word: Compel. It does not abrogate that we have free will to choose whether we’d want to do good or ill. And so does every man. But if your way of life is such that a person is so attracted to it that they desire to find out and to live it, then you have compelled someone to come into the supper. When I read this parable, I tremble because I wonder how much I’m compelling people. I’ve dedicated my life to doing it. That’s why I became a priest. I couldn’t see anything else important in life. Everything else dies. Everything else is temporary. The only thing that’s permanent is who we become. The only thing that matters for a person is who he becomes, because in becoming like Christ then you can know Him, then you can be with Him in glory, then you can be unashamed at the end of the age. Otherwise, everything is a loss. That’s all that matters. We should have that mentality, such that people would see it. Perhaps you haven’t heard of this parable being spoken of in, shall we say, evangelistic terms. But everything we do in our life should be evangelism. Should be such that we are the light on the lamp stand, not underneath the bushel basket. Not what we say, but who we are. The supper is about becoming. This coming to the supper is actually our life. Yes, there will be a time when we shall sit down with Him, but right now is the time for action. Right now the time is for effort. The time is to say: There is nothing in my way, Lord, from keeping me from coming to Thy supper; I am not going to let any oxen or any land or a wife or any other desires keep me from what is most important, and that is that Thou art my life. The apostle further talks about, after saying that Christ will appear and we will appear in glory, he gives us the key to how we will appear in glory, and this is basically how we are going to get to the supper. Because there is a traveling period from the time you are bidden to the supper and you get to it. He’s saying, “Mortify your members that are upon the earth; fornication, uncleanness, inordinate affection, evil concupiscence, and covetousness.” He says not to lie, not to commit blasphemy, have no filthy communication out of your mouth. He’s saying to live virtuously. So if you want to come to this supper, live virtuously. The calling is from Christ telling us, Live like Me. He’s made us capable of this. We are about to celebrate His birth. But His birth means nothing if we don’t obey His way of life. His birth doesn’t save us; accepting His grace and living in it is what saves us. This supper is a calling to virtue. Not just a calling to be with glory in the end. It’s a calling now to change. Look in your life, see what excuses you have. If I’m perfectly honest with myself, I could say each one of these excuses could apply to me in various ways. And certainly, the order to compel others to come in, I tremble when I think what opportunities I have not taken advantage of to compel others to come into the supper. It’s not just words of a fictional story. Obviously, this occurrence didn’t happen in, shall we say, real life, right? There really wasn’t a person who called people to a supper and then went and had his slaves to find others. It is a picture for us. But in another way it truly is happening. Are we participating in it or are we making excuses? May God help us to answer this call and also not just to come to the supper because there are a lot of people that are going to come to the supper and be very surprised because they haven’t lived that life. They have tagged along. They have considered themselves to be Christian. But let us be traveling to the supper in such a way that we are also causing others to come to it. May God help us in all things. Amen. Transcribed by the handmaiden Helen. May God save her and her family. 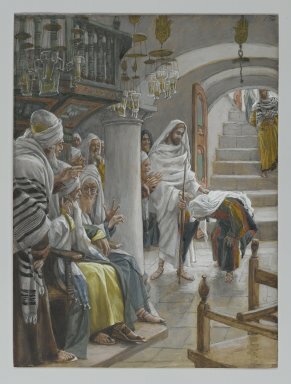 вЂњParableвЂќ of the healing of the blind man of Bethsaida. I see men as trees. Today’s Gospel reading (Dec 15/28, 2010)  is much like a parable. It is a factual recounting of the healing of the blind man at Bethsaida, and is one of the shortest recounting of a healing in the Gospels, but it has a very important and rare detail – and this detail makes it also a type of parable for us. The blind man was healed by degrees, and not all at once, as in almost every other healing of Jesus. The first, partial healing, was that a man who formerly could not see anything could now “see men as trees, walking” – that is – he could see poorly, fuzzily. After Jesus put his hands again on him and made him look up (this is no accident, there is important symbolism here! (what is it )) he could see clearly. This can be thought of as a “parable” describing all spiritual healing. We get better by degrees. Here is another example of scripture being intensely personal – and we must read it in a personal way. We read it for personal reproof, instruction in righteousness, wisdom, encouragement . This healing is not a factoid or merely a historical item – it describes our healing too. Of course, anyone with even weak and almost blind eyes “to see” knows that he has blindness – he does not always “see” things as they are, and certainly cannot see God as He is – and this is certainly because of impurity, and overall weakness and incompetence. It is alright to acknowledge this – it is the truth! Our world does not like to acknowledge sin and weakness, either because our pride and vanity is repelled by such thoughts, or because in our political (in)correct age, honesty about oneself is labeled as poor “self-esteem”. True, Christian, healthy “self-esteem” is to know deeply that we are sinners and yet /we are becoming perfected, putting off darkness, and becoming light. All lasting healing is by degrees. In this healing, the degrees proceeded rapidly, but in our lives, the degrees of healing take an entire lifetime. When I read this scripture passage, I am very much encouraged, because I get better very little at a time, and there are days and weeks and even years when I see little progress, but when I recollect a little I know I have gotten better. There is a little more heaven in me, a little more peace. I am not the man I was, and I will become the man that today I cannot be. This is the “Good News”, stated in another way. The Gospel is infinite, so it can be stated and described in an infinite number of ways. Today, it tells us that we will be healed, even by degrees, as this was the purpose of the God-man, the Good Samaritan. Mark 8:22-26 22 And he cometh to Bethsaida; and they bring a blind man unto him, and besought him to touch him. 23 And he took the blind man by the hand, and led him out of the town; and when he had spit on his eyes, and put his hands upon him, he asked him if he saw ought. 24 And he looked up, and said, I see men as trees, walking. 25 After that he put his hands again upon his eyes, and made him look up: and he was restored, and saw every man clearly. 26 And he sent him away to his house, saying, Neither go into the town, nor tell it to any in the town. In the Lectionary, the selection of Mark 8:22-26 is given for the 30th Tuesday after Pentecost, but it may be read on a different Tuesday (which varies year by year), if the “Lukan jump” (http://www.orthodox.net/ustav/lukan-jump.html) is used. In 2010, this selection was read on 12/15 (12/28 ns), the 32nd Tuesday after Pentecost. The symbolism is the same as that of Zacchaeus in the tree (Luke 19:1-9), or various references to mountains, or “Let him which is on the housetop not come down to take any thing out of his house” (Matthew 24:17 ). We must “look up” and not down, that is, think and pray spiritually, not carnally. I am at the 6th annual Winter retreat at St George Orthodox Church in Pharr Texas. Of course, most of the people here have celebrated Nativity, but Matushka Elizabeth always takes care of me with no fuss. As part of the presentation by Fr Evangelos Pepps, he sang in the Byzantine tone "Joseph was amazed", the following Sessional Hymn, and as is always the case when I here such exalted theology, I was moved to personalize it, and thought these feelings were worthy to share. After all, what good is theology if it is not lived, or does not inspire us and help us to change? The theology in this one hymn is immense! It references dozens of Scriptures and some of the most important dogmas regarding our Lord and Savior, Jesus Christ. It is important to know these dogmas, and along with this, we must feel them deeply as they resonate in our heart. Perhaps as an edifying exercise I will attempt sometime to reference all the important dogmas and scriptures that are related to this hymn, but I am on a slow modem, with little time because of the retreat. I at least wanted to bring forth two points. 1. Our hymnology always has a sense of wonder – and this is unsophisticated and shallow as we see so often in this season, but theologically intricate and unspeakably beautiful. If you want to understand the incarnation, we Orthodox do not hide this dogma – it is present in all of our services, especially matins on ANY day, and especially on the Nativity and major feasts! It is all there, if we stand, and incline our heads, and listen! It may take years of listening, but it does sink in. Those who have stood in many vigils know what I mean. 2. "He Who Is * became what He was not". There are deep theological implications to this part of the hymn, but more than any other part, it gives me great hope concerning the purpose of my life and the "lively hope" I have for the fulfillment of this purpose. I feel these words as a solemn promise to me (and you, and all mankind). There are many things that I am not. One can even say that if we are not in Christ, we are "not" – there is no meaningful existence outside of Christ (and becoming like Him), since everything else is temporary and shallow. I feel my fallen humanity deeply, but I also feel deeply the promise that our Lord has made because of His incarnation. He took on our humanity, which was marred by sin, and changed it – fundamentally, and made us capable of attaining perfection. He also taught us the path to perfection, because one needs ability and knowledge to accomplish anything, whether secular or sacred. I who am not, and have not, can become like He Who is. This is the core meaning of the Incarnation of the Son of God, and we can never state it too many times, or in too many different ways. Glory be to God. A quiet milestone on the blog and a request. I have been a little out of juice in the blogging world lately, and have not posted to Redeeming the Time for a while (not from lack of material – our website has tons of stuff on the Nativity, including the Sundays preceding it and Sunday after it), and therefore missed a little milestone. and now averages about 5000 views a month. Total views since we have been keeping track is 101,906 (and growing – not like the Google Storage statistic, but still, growing). If a link to our blog was listed in the links of more Orthodox blogs (we seem to be a "well kept" secret, despite (or because of) our limited abilities and efforts in "social networking") our growth would increase. We have an ambition to give the blog a facelift, since it is very plain, and have started, but the pace is slow, and our time and abilities in web design are weak (and outdated). Eventually, the entire website is hoped to be a WordPress installation, and when that happens, our monthly readership will be over 125,000 pages, since our yearly page views over the entire website is a little over 1.5 million. 1. Suggest the blog as a link to other blogs. We will exchange links in many cases. You could also republish links from Fr Seraphim's Facebook page (Priest-Seraphim Holland) or Twitter account (http://twitter.com/seraphimholland). 3. Lend your expertise in redesigning the blog and creating "pages' for all the content on our website. Sunday Of The Holy Forefathers The Great Supper. Audio Homily 2010. Synopsis: The Parable of the Great Supper is explained, and compared with the Parable of the Wedding Feast, and selection from Colossiona is related to the inner meaning of the parable. Holy Apostle Andrew the first called. Questions and answers. 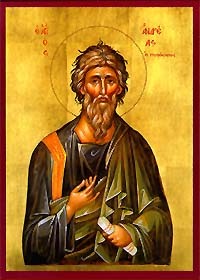 Today, Nov 29/ Dec 12. we celebrate the Holy Apostle Andrew. Besides taking the opportunity to eat fish during the Nativity Fast, due to St Andrew's feast. it would be good to learn a few things about this holy Apostle. The followiong are some simple things about St Andrew, in a Q&A format. The Holy Apostle Andrew has a "nick-name". Examples of other "nick-names" are: John "the dwarf", James "the brother of the Lord", John "the Theologian", etc. What is St Andrew's nick-name? Why? The Holy Apostle Andrew is known as the "First Called", because he was the first among the twelve apostles the Lord chose to follow Him. Who was the Apostles Andrew's brother, where were they from, and what was their profession? Simon Peter was the elder brother of Andrew. They were fishermen, in Bethsaida of Galilee, near the sea of Galilee. St Andrew was formerly a follower of someone else before following Jesus. Who? Explain. At first St Andrew followed St John the Baptist, but then, hearing the Forerunner speak of Jesus, he became Jesus' disciple. What great favor did St Andrew do to his brother, on the day he met Christ? He made a bold statement. Explain. He told his brother that he had found the Messiah, and brought Peter to Jesus. After the giving of the Holy Spirit, St Andrew preached the gospel in many places. One place is particularly dear to Russian Orthodox Christians. Where? Describe the incident. After preaching around Byzantium and the Black Sea, St Andrew traveled north, reaching the River Dnieper in the land of Russia. He halted on the shore beneath the hills of Kiev, the future site of the city of Kiev and the great monastery of the Kiev caves. There, he said to his disciples who accompanied him: "Believe me: on these hills the grace of God will shine forth. There will be a great city here, and the Lord will raise many churches in this place and enlighten all of the Russian land with holy baptism." Ascending the hills, he blessed them and planted a cross, foretelling the conversion of the people and land of Russia. Who was St Andrew's wife? St Andrew had no wife; he was a virgin. How did the Holy Apostle Andrew die? St Andrew healed of a disease of the eyes and then converted Maximilla, the wife of Aegeates, proconsul of the city of Patras in the Peloponnese, for which he was tortured and beaten and finally on an x-shaped cross. From his cross he preached and exhorted the people, converting many to the true Faith. Aegeates, fearing the people, sent servants to take the apostle down from the cross, but they were unable to approach and could not see the saint for the brilliant light which surrounded him as he prayed. When the light dissipated, he surrendered his spirit to the Lord. After Andrew's death, Aegeates was possessed by a demon and died in torment in the midst of the city. How does St Andrew appear in icons? St Andrew is shown in icons as an older man, with long grey hair and beard. Here are some liturgical questions about the commemoration of St Andrew. What is the "rank" of the service for St Andrew? The vespers has how many readings? What type of books in the bible? Why? The service for St Andrew is of polyeleos rank, the second highest rank. In Vespers are read three readings from the epistles of the Apostle Peter. What feast do we begin to sing more about on St Andrew's day? Look at the theotokia for Lord I have cried and the Aposticha for a hint. We begin to hasten preparations for the Nativity of our Lord. The theotokia for "Lord I have cried" and the Aposticha are taken from the service for the Forefeast of the Nativity. When God created the universe and all that is in it, He saw that everything was good. He created man in order to be the pinnacle of all creation, the perfect embodiment of all that exists in the universe and the ruler over it. Through man, God would commune with His creation and through man all of creation would commune with God. For this high calling – to be the link between creator and created – man was first created. However, as we know, man strayed from that calling by his own sin. Rather than ruling over all creation, man was made subject to creation – vulnerable to all the hardships and dangers within it. This change in place did not negate the high calling and purpose for which he was created, but it did result in many insurmountable barriers to the fulfillment of that purpose. In order to rescue man from this predicament in which he put himself, God has come to raise up again as many as will hear His voice and follow Him. And so, God, the creator, has become man in order to restore man, the creature, to his original place in the order of creation. The God/man Jesus Christ has come to save us, that is to restore to us our life of union and communion with God that was lost by our sin. In the Gospel today, we heard an account of the healing of a woman who had been disabled, that is bent over and unable to stand erect, for 18 years. This healing illustrates for us the salvation that God has come to give to us. Just as this woman suffered and was crippled by a twisted and bent body, so also we are all crippled by a twisted and bent soul. The burden of our sins has weighed us down and though we may desire to reach up to God, it is not possible because our soul is bent so severely. This woman had no ability to straighten herself or even to look up at another person, but Jesus seeing her condition came to her and spoke to her, raised her up by his word and blessed her with the laying on of His hands. He is the good shepherd who seeks out the lost sheep and when He sees one of His lambs caught in the trap of his sins, half dead and injured by the thorns of sin, He does not wait for the lamb to cry out for help, but makes the first move to come and free His lamb. In this case, He spoke to the woman first, saying to her “Woman!” He did not say “Cripple” or “Monster” or “Sinner”, but rather “Woman”. With these words He reminds her that she is not merely some animal or some useless cast off, but she is a unique creation – a creation in the image of God. She is called not to look constantly at the dirt and dust of the world, but to look up to the heavens to search out the face of God. She is called not to be an outcast but rather to live in union and communion with God. This is the same thing that our Lord offers to us. He does not come in wrath to punish us, but He comes as a loving and compassionate shepherd to rescue us from our crippled state. He first speaks to us, reminding us of the purpose for which we were created, restoring to us the dignity that we had cast aside in our sin and which was then stripped from us by the demonic tormentors. Jesus speaks to us calling us “Man” and “Woman” reminding us that we are not animals, we are not driven by instinct and passion, we are created with a high purpose and calling, that we do not look down at the earth but rather up towards heaven. In this way He restores to us our lost dignity – as a prince who had been captured, beaten down and enslaved by enemies is suddenly ennobled again by the memory of his birth and the reminder of what he was born to be. Having reminded us of our calling and purpose, our Lord then frees us from the crippling hold of sin on us. He lifts the burden of our sins which we carry and heals the damage inflicted by our sins. When we sin, it is not just that we disobey a law or break a rule; each time that we sin we inflict upon our soul a new and fresh wound and we pick up a stone which is then added to the load that we carry. This burden of stones weighs us down and holds us back from ascending towards heaven. Each injury that is inflicted weakens us and impairs us a little more so that our soul is constantly sapped of its strength. But simply by His healing word, Jesus removes this burden from us and heals our wounds making it possible to straighten up and to strive again towards that purpose to live in union and communion with Him. But it is not enough to simply know of our calling and to strive towards it. No man, by his own power, can ascend into heaven and stand before the throne of God. We need help and so our Lord gives us what we need. He lays His hands upon us and fills us with His grace. It is this grace of God working in us that lifts us up from this world and which transforms us into the image and likeness of God. The grace of God makes up that which is lacking in us and it is by this grace, this gift of God, that we are then able to pursue our calling and purpose. By using the grace that God has given us and by joining our labors to that grace, we can be transformed, we can be changed, we can become not only new, but perfect creatures rising to stand before God and to bask in the light and warmth of His presence. With the help of God’s grace, not only can we look up into heaven seeking the face of God but we can ourselves rise up to heaven and stand before Him living in union and communion with Him. This is our calling and our purpose; this is the reason for which we were created. The “reason for the season” – that is the reason that Christ Jesus came into the world – is just this, to save all of us who suffer under the burden of sin. He restores to us the dignity of our calling. He heals us with His word and delivers us from the burden of our sins and the injuries which they have inflicted upon our souls. He touches us with his hands and imbues us with His grace by which we are perfected and brought into union and communion with Him. This is the purpose of the incarnation, the coming of the God-man Jesus Christ. God has come and dwells among us so that we might also live with Him. Synopsis: The epistle read today succinctly sums up the reason for the incarnation of the God-man: "Jesus Christ came into the world to save sinners". To understand this, we must understand what sin is. Most have a great misconception about sin and only think that is is something that offends Almighty God, and do not understand that the reason God is offended is because all sin darkens us, and makes us "bent over", unable to see God and know Him. The effect of sin is well shown by the woman with the infirmity of 18 years. Lets us explore what sin does to us, and the only solution to our terrible predicament. It looks like my dear friend Sasha is in her last days. She has stopped eating, and her cancer, which until a week ago did not seem to affect her, seems to have run its course. She has the anorexia typical of end-stage cancer, and is having a lot of trouble getting around. Her breathing has become labored. My wife called today and offered to take her to be put down while I am at work, but I need to say goodbye to her. I plan to celebrate liturgy tomorrow, then take my friend and companion to the vet later that morning. Two weeks ago she was cavorting with her new companion, Princess, a 1 year old miniature schnauzer, and the two have become best friends. 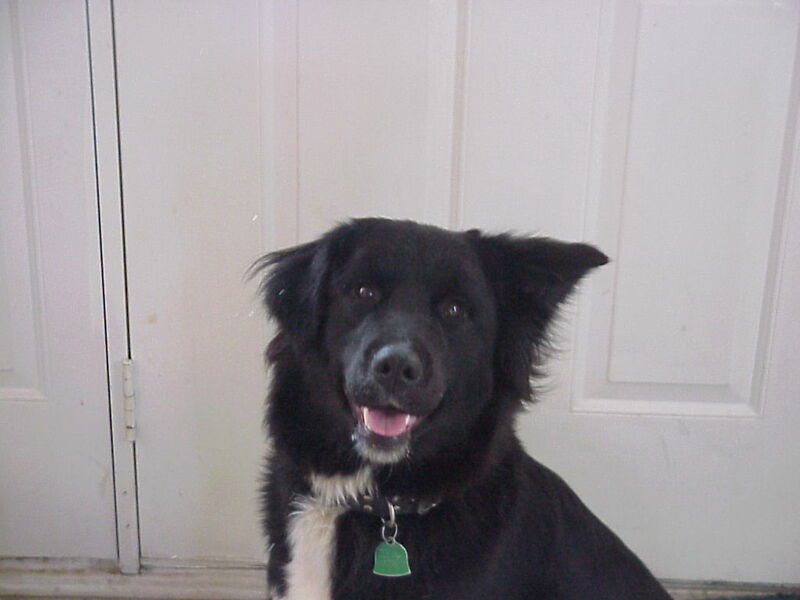 Sasha has always loved people, but the Akita in her (she is half Akita, half Border Collie) has always been very dominant with other dogs, especially females. When I was offered to take Princess home, from a parishioner who cannot keep her anymore, I brought Sasha to the house, and she met Princess on the little dogs’ territory. They became fast friends. Princess is not your typical Schnauzer – she doe not bark, except very occasionally when excited and playing with Sasha. I knew Sasha had cancer (a mediastinal growth) for over a year, but she has still had a lot of vigor for an old girl, and only a couple weeks ago, she was running in the woods with my grandchildren and I.
I do not have any illusions about dogs. I don’t have any patience for all that new age stuff. They do not go to heaven, and they are not angels. They have a soul, as all animals do, but their soul is not eternal. When they die, they pass out of existence, but while they live, the exceptional ones are a great gift from our creator, and Sasha has been so good to me so many times, than I have thought of her as a kind of “guardian angel”. I have been through a lot of life with Sasha. I got her from the pound in Plano, only days before I was to go on a trip to Russia. I was in pretty big trouble for this, because, shall we say, I made a unilateral decision. When I saw Sasha at the pound, she was an absolutely beautiful , alert 1-2 year old dog, in a large cage with at least 8 other dogs. As I walked to the cage, all the dogs were against the cage, barking. Sasha was not barking, but just looked at me, and, I do not want to be too mystical here – we (Sasha and me) just knew. Sasha likes everybody, but she has always been my dog. Most of her life, if I was home, she wanted to be with me. Only lately, did she not as readily get up and come join me when I went into my study, but she always came when called. I believe dogs teach us a lot about Christianity. They are loyal, obedient, and they always forgive. I have had plenty of difficult times in the past 10 or so years, and Sasha always seemed to know. When I was really down, she would come and join me on the couch. Normally she did not like to sit on the couch, but on the floor beside me. She has always been a constant in my life. 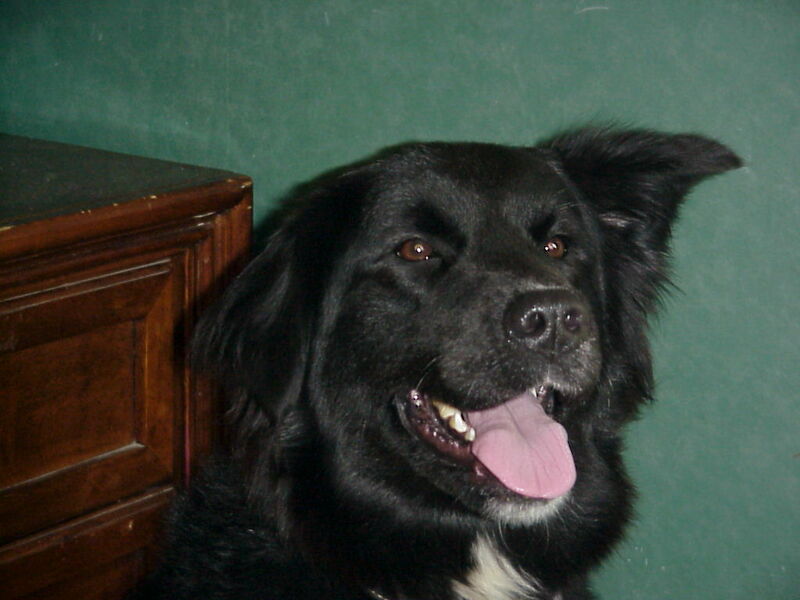 I am not much of a constant – I have good days and bad ones, but Sasha always had good days, and was always chose to not leave my side when she sensed I was not doing so well. For Sasha, I am grateful to God. She was there for me in some dark times. I am glad that god’s love is so powerful that is can even be expressed in the ways of senseless animals. I will miss Sasha, and in some ways I do not need such a special companion anymore, but I hope that someday I can find one that is like her. You are currently browsing the Saint Nicholas Orthodox Church blog archives for December, 2010.